We love working with Time2Shine Soiree! They've provided their photo booth at our annual Staff Recognition Party as well as our Bridal Showcase several years in a row. Love their props and booth options! Staff is friendly and reliable. 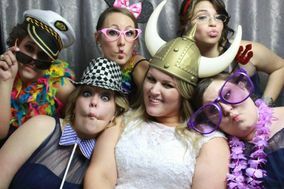 The photobooth services by Time2Shine Soiree were the talk of our wedding! The staff was extremely knowledgeable, fun, friendly and efficient. They captured some unforgettable moments that we will cherish forever! The quality of the photos was amazing! We were so pleased with the experience and pricing that we have already recommended Time2Shine Soiree to family and friends!